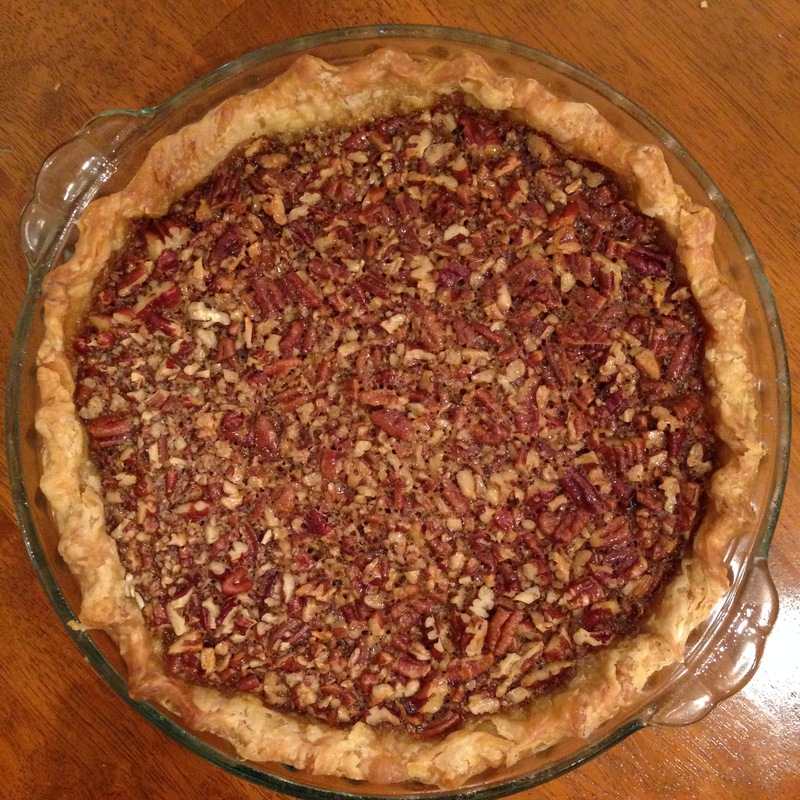 Last year, I baked and ate my first pecan pie despite the fact that my mom had made pecan pies for many Thanksgivings. And… I LOVED IT! However, I didn’t really like the recipe that I used. There was some difficulty with the pecans not rising to the surface. I also wanted to see if I could find a recipe that didn’t use corn syrup. Enter America’s Test Kitchen’s Old Fashioned Pecan Pie recipe. The combination of maple syrup, brown sugar, and a bit of molasses was a wonderful flavor profile. It was so much better than last year’s pie that I’m not sure I will try another recipe next year. I do think I under-baked the pie slightly, though, which seemed to be a recurring theme for my Thanksgiving pies this year (in addition to lousy pie crust making). I took the pie out in between 45 and 50 minutes of baking as the top appeared to have set. However, I don’t think the filling was quite cooked yet. I will note that I did not follow the direction to refrigerate for ~3 hours, so I will try to do that next time. Make pie crust. Preheat oven to 450 degrees, with oven rack placed at lowest position. Heat maple syrup, brown sugar, heavy cream, and molasses in a saucepan over medium heat until sugar dissolves, stirring occasionally (3 minutes). Remove from heat and let cool for 5 minutes. Whisk butter and salt into mixture until combined, then whisk in egg yolks until incorporated. Scatter pecans in the pie shell, then carefully cover with filling. Place pie in oven and immediately reduce temperature to 325 degrees. Bake until filling is set and center jiggles slightly (45-60 minutes). Cool pie for 1 hour, then refrigerate until set (~3 hours).